Heat oven to 400° F and gather your ingredients. In a large skillet over medium heat, brown sausage. Remove from heat, stir in cheese, 1 teaspoon pepper and 1/4 cup Progresso™ soup. Spray a pizza stone lightly with nonstick baking spray. 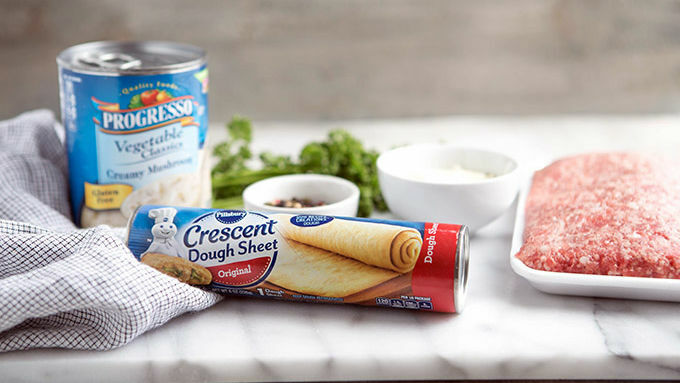 Open, unroll and separate crescents at perforations. 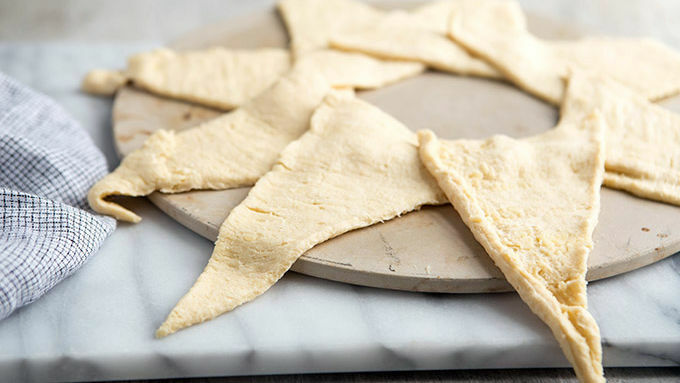 Arrange large end of each in a circle around the center of prepared pizza stone. Spoon sausage mixture on top of the large, connecting ends of crescent ring. Fold top 1-inch of each crescent triangle down onto itself. 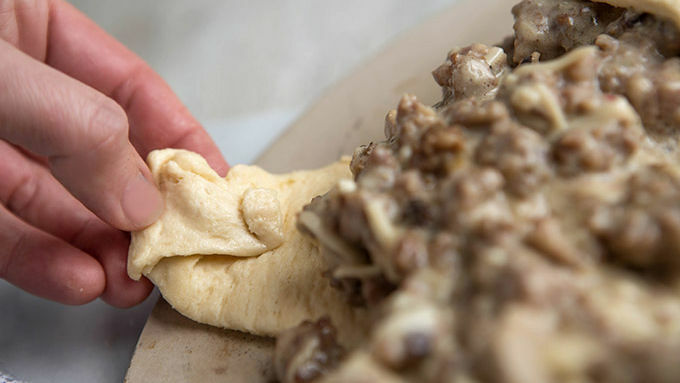 Then pull small end of triangle over meat mixture, pressing it onto the bottom dough of ring. Repeat until all triangles have been folded over mixture. Sprinkle with grated Parmesan and cracked pepper, and bake for 17-20 minutes, or until medium golden brown. Return skillet to medium heat. Add remaining Progresso™ soup and garlic powder to any bits left in the skillet. Once warm, transfer to a medium-sized serving bowl. Remove sausage ring from oven. Allow to cool for 3-5 minutes, then gently press edges of ring up to give it a “filled” look, instead of “melty”. Garnish with parsley, if desired, and place bowl of gravy into the center of the sausage ring and serve. Serve up a classic… with a twist! 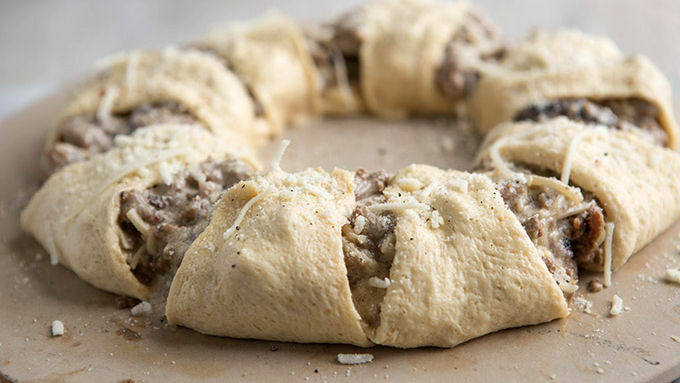 We’ve taken classic sausage and gravy and baked it into a golden brunch ring. Perfect for lazy Sunday mornings, this savory dish is great to share. 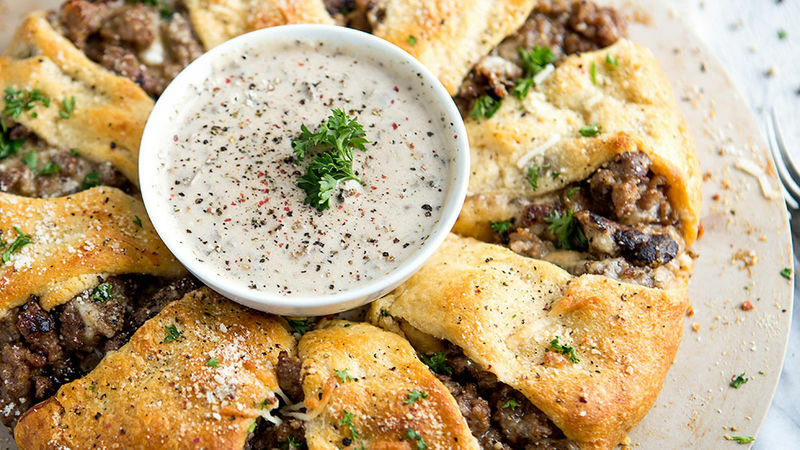 When it comes to comfort food, sausage and gravy is high on the list of irresistible eats. There’s something about covering a piping hot, mile-high, flaky buttery biscuit with peppery, creamy gravy and salty bits of sausage. Just talking about it has me hungry. So, what could be better than sausage and gravy? How about a party-perfect brunch ring that feeds a crowd with all of these classic comforting flavors? A clever twist on the traditional, this incredible brunch ring is about to become a new fave. Here’s how to get one in your kitchen. Saturday morning is begging, you know.